The RUT outperformed today moving up nearly 0.80%. I removed some lower BFs’ on both the M3 and what’s left on the Rhino trades. I’ll be closing all of these trades before Monday and move into Rhino trades for February expiration. With the OV issues etc, I might not enter any more M3s. I feel much more comfortable with the Rhinos and I’ll add some bearish butterflies. Anyways, it has been a great month for the trades and I am looking forward to entering the February trades. I did actually get 4 units on for February 1190/1150/1100 for $2.54. It’s a bit early but with the thanksgiving break coming up, I wanted to get some safe theta over the break and I had GTC orders that filled. The regular entry day would be next week on Thursday. However, I scale into my positions as I usually go with a lot of units. Here’s what my trades look like. I don’t have exact P/L numbers yet because I had to switch to an old VM that had an older version of OV installed. Still not 100% confident in the M3 trades at the moment. Everything is going my way in the trades this month. I’ll be taking a lot off tomorrow close to profit target and I will start some Jan m3s and some Feb Rhinos next week. I’ve got another 2 Rhino trades hitting around 8% now and I am closing the big one for 10%. The M3 trades are all sitting with great profits as well. 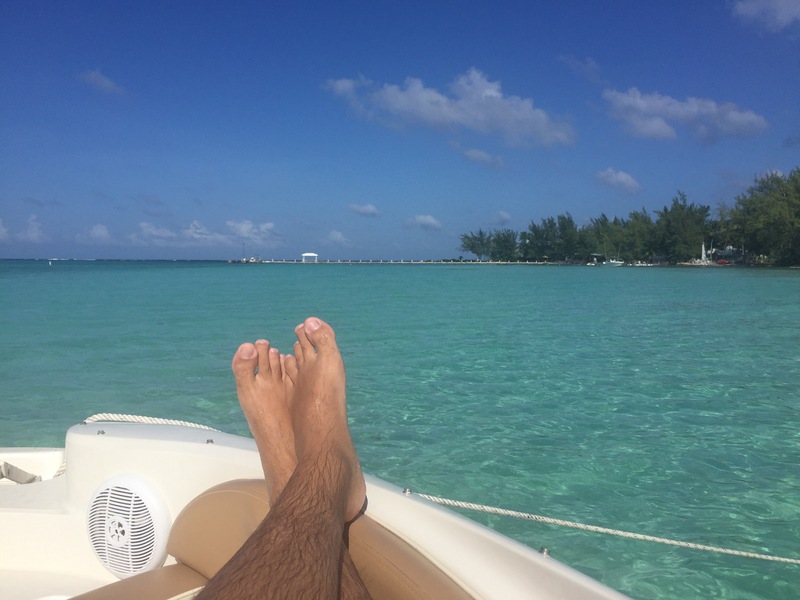 A good time to unwind and get into the next months trades. In case anyone doesn’t know, the OV issues aren’t really solved and the modelling is definitely different. John Locke posted “Regarding the Greeks numbers. The variable settling is currently showing too negative Delta and is projecting too much sag¦ IN THE FRONT OF THE POSITION. 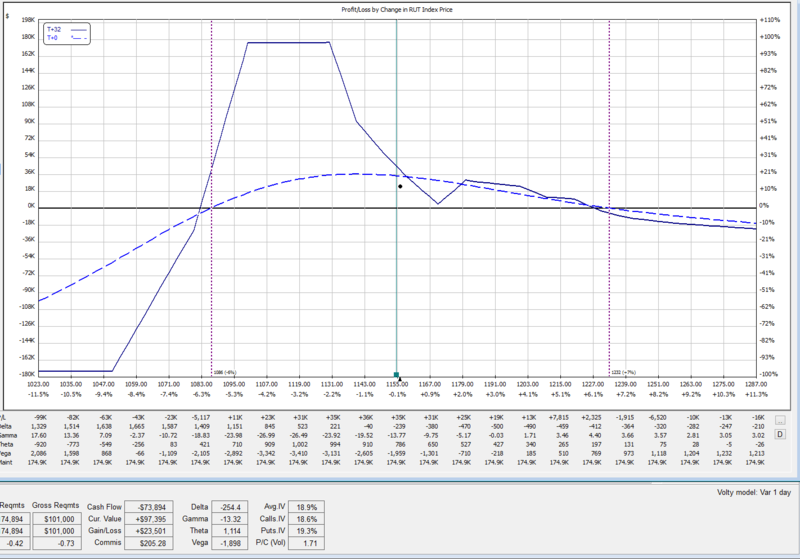 The EIOIO is showing too positive Delta and not enough sag ¦ IN THE FRONT OF THE POSITION. I am fully out of the November trades at 3.2%. Not the best result but not terrible given the incredible movements we’ve seen during the trade. I believe we started it when RUT was at 1080 and we saw it touch 1200 and revert back down to 1155. I think I could have closed it at about 5-6% around 21 DTE. With my M3 trade types, I’ll probably take 6%+ at 21 DTE rather then trade closer. The December trades are doing great now. I closed my Bearish butterfly at 20% and the RHINO is approaching its profit target of 10%. The other trades are all around 3-5%. This time around I’ll be closing them before next Thursday (21 DTE) and I’ll start entering some January M3s and some February Rhinos. I’ll be protecting the upside quickly this time around. If it looks like we’re starting the santa rally, I’ll be flattening my upside. I was somewhat reluctant to do it too quickly today but tomorrow and the following day I’ll be watching. This week is November OPEX and we’ve been rallying into opex lately and also, Nov 20 to Jan 5 is the period known as the Santa claus rally period. I’ll do this by removing some lower butterflies, adding calls or adding put credit spreads. Here’s the RHINO I’ll probably take off in the next day or two at profit target (25k). I tend to leverage quite a bit and I noticed on one of my accounts the amount of margin needed as trades approach expiration drastically increases. Something I’ll be taking into consideration for next month. I had to transfer funds from another account in to cover the margin when the RUT experienced big volatility spikes last week and as expiration in Nov approached. I went from having 50% of the funds available to being in a margin call situation. Anyone else that uses PM should take note of that. That said, I had like 1/5th the planned capital available in that single account. The market touched 1200 on Friday and we’ve pulled back to 1178 and now are sitting in the middle @ 1185. We’ve seen a lot of the P/L come back into the trades which is nice. All of the trades are doing well. I’ve done some adjustments to protect on the upside and I think we’ll have a solid Nov/Dec. I am looking to close out most of November trades on any pullback into the 1170s. 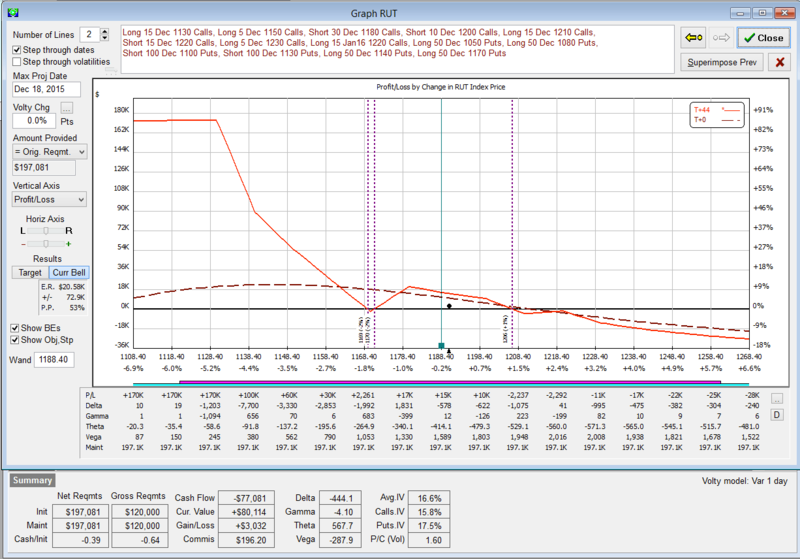 I’ve already took off about 10% of the bottom butterflies to flatten the T+0 on the upside when we hit 1182 today. OV issues have been an extreme headache but I found an old VM with 7.66 installed so I’ve been using that to model the trades. All in all, things are looking good. 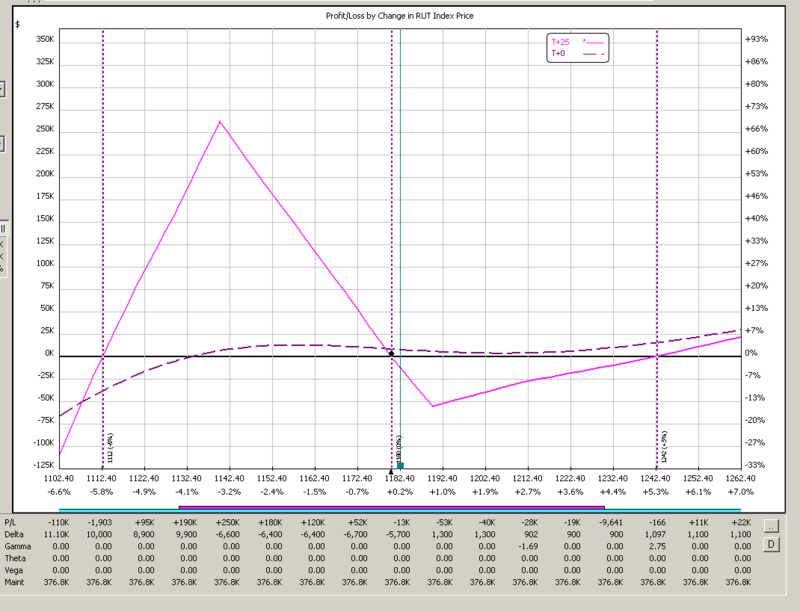 It appears that the optionvue models have actually been spitting out inappropriate deltas for the past few weeks. They’ve been giving higher than the normal negative deltas and would have resulted in some unnecessary adjustments. There was a big problem with the modelling. It’s apparently fixed and I’ve updated my software, but it seems “off” still and my confidence in the modelling is slightly shaken. Hard to trust. I don’t think any of the adjustments had cost me too much and it’s not bothering my Rhino trades but it is bothering my M3 trades. Today was a down day and our trades should have seen some profits but it was actually the opposite. This is likely due to the drastic change in option skew and also perhaps some of the modelling issues. That and the recent 115 point run up and the drastic change in option skew has made this month quite challenging to end. This is now 3 months of challenges in a row 🙂 The OV problems are all over the internet boards and everyone is chatting about them. The president Len Yates released a statement yesterday. The market pulled back a little yesterday and allowed me to do a few more adjustments to flatten out the T+0 lines to the upside. The M3 and Rhino trades don’t love big up moves like what we’ve seen in the RUT during the past 25 days (9% up). Usually, the most you can hope for is slightly positive to break-even on those types of months. The NOV positions are all still up money but I await a more decent pullback to get them closed out at profit targets. They’re doing well considering and as we’d expect in the current market conditions. When RUT was at 1140-1160 we were rocking but at 1190-1200 they’re just mediocre, especially since the 50 point move occurred closer to expiry. This sets up opportunity for December and January so I just wait it out with patience. A mediocre month during a big up move usually leads to out-sized gains in the months following. 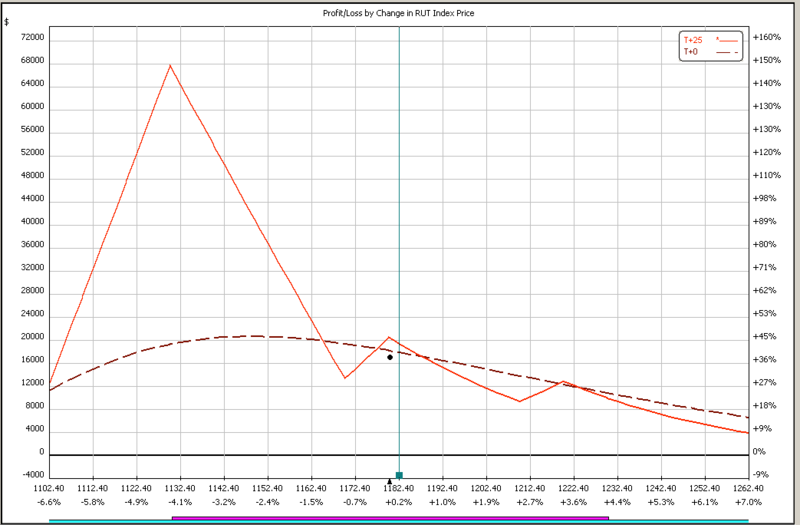 The December trades were profitable but now are just hovering around slightly negative to break-even. All as expected. I think these trades are setup great going into the next 40 days. The January trades are mostly entered and also setup perfectly. I entered a lot of them with RUT at highs. They naturally have a bearish bias so they should do well with little upside risks present. Even if we top out at 1240 (see below), they’ll do great. The RUT usually moves an absolute maximum of 160 points (the most extreme) and we’re 120 points into that. That puts the top at around 1230-1240. However, More often and usual, the RUT moves about 120 points before reversing and that puts us at 1190-1200 which is where we sit now. My plan? I am being as patient as possible with adjustments and trying to get the T+0 line flattened on pull backs. If the RUT pulls back to 1150 area, we’ll probably exit most of our November trades at profit target. If it continues up, we’ll eek a bit more but they’ll be more in the 1-5% range. Yesterday I attended the Locke community coaching seminar and had taken some notes that reminded me of some things. 1. 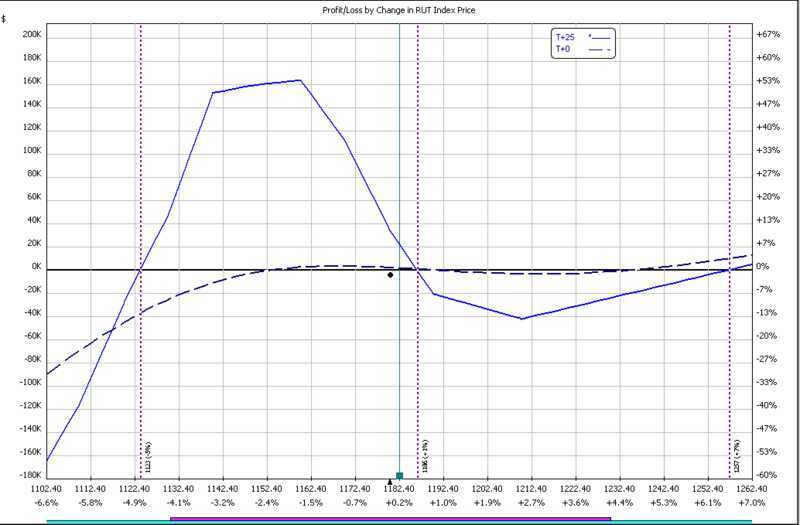 Using BWB or BFs as upside adjustments (sort of like the rock trade) instead of put spreads. I had actually done a few like that this week but had not back-tested it extensively. Someone in the Locke community has and the results were apparently fantastic. This is on my list to do (verify). Essentially, you add a front-running broken wing butterfly or butterfly in front of the market to hedge or flatten the T+0 line, and to reduce vega and theta issues. Mostly though, it works very well for reducing Vega. This will do better if you think the market is going to hang around there or only go up a bit more. A put spread would do better in a larger up move. 2. The other adjustment that I don’t actually do much but was mentioned is the stretch adjustment on the M3. 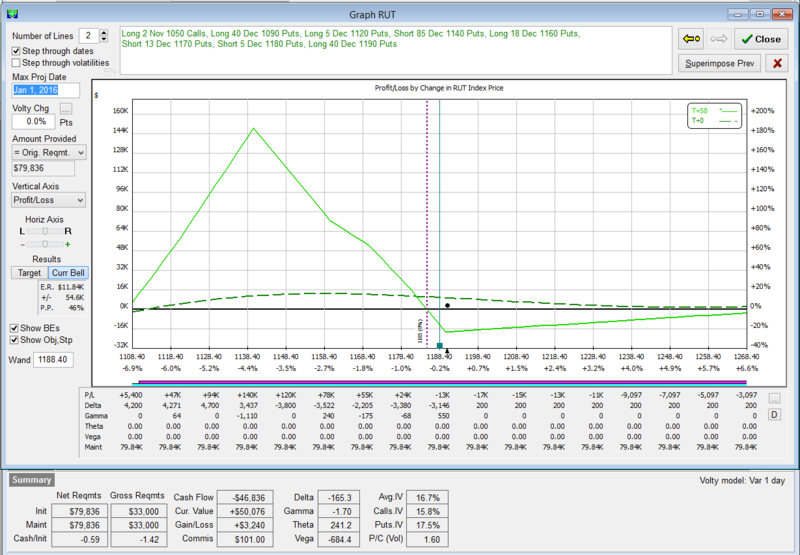 Essentially when adding a put spread, you can also roll the upper long forward to get it closer to the market. 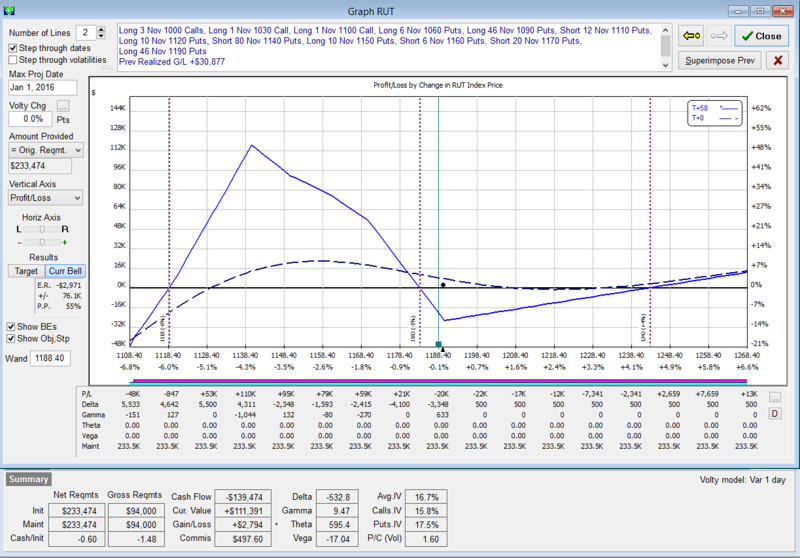 I usually only add put spreads and roll in the bottom (capital reduction) or top long (flatten t+0). I hadn’t rolled out the top long before (get tent closer to market) and will be reviewing this in the upcoming days. I haven’t posted screenshots in the past few days as I awaiting Option Vue to fix the crazy issues they’ve been having with volatility modeling. This trade will benefit greatly off any pullback and will probably hit profit target at 15-20k. If it sits, we’ve got some theta and we’ll likely pull it off at 6k profit. If it goes up, we’ll adjust more probably by adding a BWB ahead of the market. That’s not standard but I can’t see it going much farther than 1210 on this go and for that it should be better than a Put credit spread. In either of the three cases, the trade will be profitable despite a 9% up move in the RUT. This trade was up about 11k but now sits around 3k which is as expected for the environment and the time in the trade. I am extremely confident in the trade and believe that given the huge up move, this trade will hit targets in the next 3 weeks. For now, it’s about patience. RUT and the market in general are on a tear. The SPX MACD is over 3 and has only been that high twice since 1996. It’s extreme. The move up in RUT to 1194 has put most of our trades only slightly positive. It erases most of the gains for the month but the trades aren’t over yet. I eliminated most upside risk today but it’ll cost. I need to do more this week as some of the trades are now vega positive and need BF roll ups. I didn’t do today or yesterday as I want to wait a few days for the market to calm the eff down. I did add a lot of upside adjustments in the form of credit spreads and call bfs to allow for this wait. I’ll probably look to roll by Thursday and surely before the weekend. There’s lots of market moving events this week (loads of fed speak etc). The 12-13 percent move in the last month puts our types of trades in a more of a break even posture. We just aren’t moving much these past few months re p/l, well, last week at 1140 we were crushing but now most of that is gone in the recent 40 point move up. But there is opportunity here at 1190-1200. It should soon exhaust itself as it is 120+ points off the bottom and in the past several years that is the max RUT moves. Ideally we have a bit of stagnancy or downward bias. Until then we just cover our upside risk and wait for profits. I guess patience is what is needed here.